Kids love Halloween and all the candy they get to eat. Most of the time, Halloween brings more candy then a child really needs. So what do you with all that leftover candy? We’ve found four options that will hopefully make your Halloween more enjoyable. They will gladly accept any wrapped candies to add into their care packages going out to military members who will be deployed this holiday. You may drop off at these locations until Nov. 9th. No chocolates as they will melt during shipping. Drop off candy and dental supplies November 1-9! Halloween Candy and Dental Supplies Wanted!!! Deployed Troops, Veterans, and First Responders love finding your donated candy in their Care Packages. This year we’re also collecting dental floss, travel size toothpaste, pens and mechanical pencils. 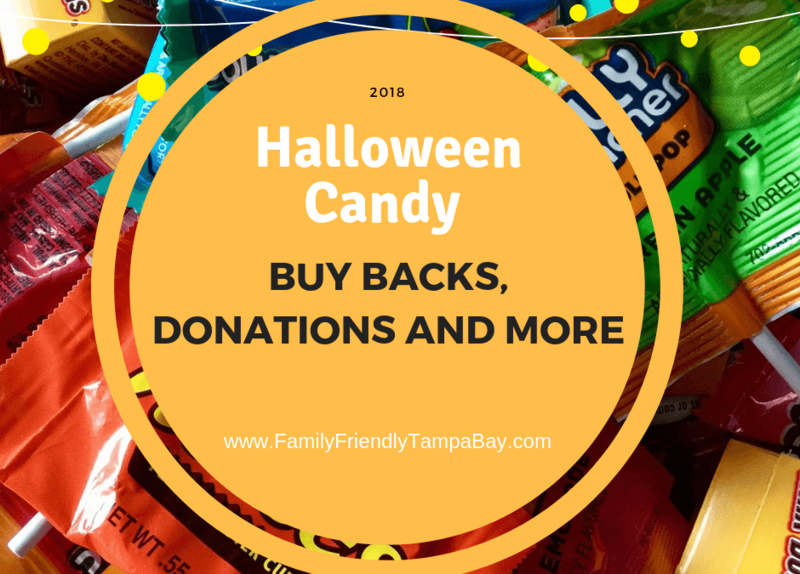 Through the Halloween Candy Buy Back program, Doctors across Tampa Bay are offering money/offers/prizes in exchange for your child’s candy. Many are donating these candy to the troops as care packages. $1 for every pound of candy donated. Bring us your Halloween candy and we will buy it back from you! You get $1 per pound and Hope Children’s Home gets $1 per pound! Nov. 1, 2, 5 & 6, 2018 from 9 am-5pm: Every lb of candy gets an entry into their $25 Giveaway. Every lb of candy gets you $10* off one pair of glasses. Every child who comes in with candy can schedule a free vision screening test at our office. Restrictions:*Up to $50 off a pair of glasses. Cannot be combined with insurance or any other discounts. November 1, 5 & 6, 2018 from 8am-4pm: Trade in your candy for a goody bag with a Culver’s Gift Card. Nov. 5-9, 2018 during regular business hours. For every pound of candy, receive $1. Up to $5 only, however you may donate more. Nov. 1, 2018 from 3:00-5:00 p.m.
Nov 1-2, 2018 from 1-5 p.m. at all six locations below. We will buy back your treats to send our soldiers something sweet. Besides just eating it, you could always make a trail mix out of it. Use it as toppings on ice cream, inside brownies or rice krispies treats. -Chocolate: Dark chocolate can be kept for one to two years if wrapped in foil and stored in a cool, dark and dry place. Milk and white chocolates last up to eight to 10 months. -Hard candy: Lollipops, roll candy and butterscotch candies can last up to a year when stored at room temperature or in cool, dry conditions. Liked this article? Sign Up to receive our weekly weekend newsletter to get free & cheap things to do in the Tampa Bay Area, right in your mail box. Become a fan on Facebook,Twitter, Pinterest, and Instagram for daily updates. Check out our Community Event Calendar for daily events.